Dubai: The major visa policy changes that took into effect this week will not just benefit expatriates, but boost the local economy as well, sources have said. Starting Sunday, October 21, sweeping changes to visa regulations in the UAE are being implemented, and these include the extension of entry permits for visitors and visas for women. The Federal Authority for identity and Citizenship (ICA) confirmed last week that it will begin extending the residency visa for widows and divorced women and their children for a year without a sponsor. The residency visas of students sponsored by the parents will also be renewed. For foreigners in the UAE whose entry permits will expire, they will get an extension of 30 days without leaving the country at a cost of Dh600. The extension can be granted twice only, regardless of the main duration of the original visa. Sources in the tourism industry, as well as those who specialise in talent and human resources, have welcomed the decisions, citing that they enable foreigners, especially jobseekers, and visitors who have come to the UAE on business, to conveniently extend their stay in the UAE. “The decrees enhance labour market by providing chances for various establishments to utilize the competencies existed in the state and reduce the need for recruiting labour from outside the state,” a statement from ICA reads. "There are a number of people who come on tourist visas and then start looking for employment opportunities in the UAE and it I this segment which will benefit from the new rules as they can now get a visa extension on their tourist visas without having to exit the country," Premjit Bangara, general manager for travel at Sharaf Travel Services, said. And with more foreigners staying longer, local businesses can benefit from higher consumer spending. At the same time, visiting families of expatriate workers will be able to spend more time with their loved ones in the country. “The UAE is already a very attractive destination for tourism, business conventions and exhibitions. Added flexibility to allow visitors to stay longer will further enhance UAE’s position as a destination of choice,” said Harish Bhatia, regional director for Middle East and Africa at Korn Ferry, a talent consulting firm. “It also gives the large expatriate workforce a chance to bring in their extended family for longer periods. This is strategic step in the positive direction to boost the economy and further bolster the positioning as one of the top cities and countries in the world,” added Bhatia. A huge proportion of the UAE’s workforce are expatriates and many of the professionals who have moved to the UAE for employment have left their families behind in their home countries. “People extending their tourist visas for various reasons would then spend more money locally on hotel stays and retail which would also contribute to the economy along with the fees levied on these visa extensions,” noted Bangara. “The new visa policy [will also] benefit women who have been divorced and widows to stay longer and put their lives back in order, as they will be given a one-year visa extension. It will also benefit students sponsored by their parents… and [they] can study locally in the UAE which in turn would benefit colleges and [other schools],” he added. During the first six months of the year, at least 8.1 million tourists visited Dubai alone, up from 8.06 million in the same period of 2017. 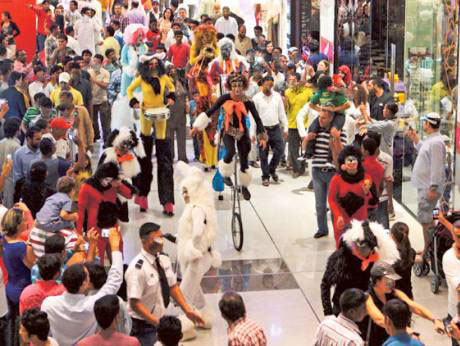 The emirate’s top source for visitor traffic remained India, Saudi Arabia and the UK. Indian visitors during the same period accounted for more than one million, registering a 3 per cent increase over a year earlier. What are the visa changes taking effect today? The government will grant a one-year residency visa extension without the need for a sponsor starting from the date of spouse’s death or divorce. The extension also covers the applicant's children living in the UAE. Those who don’t have children can avail themselves of the extension. The application for extension is subject to conditions and regulations. For example, the applicant should have the residency visa sponsored by the deceased or former husband at the time of death or divorce. The residency visa should also be valid at the time of death or divorce, and the children’s residency period does not exceed that of the mother. There should also be proof that the woman has been divorced or widowed, and that she has a residence and the financial ability to provide for the family. Both visitors and tourists can apply for a new visa after the expiry of the first one without the need to leave the country. Expatriates living in the Gulf Cooperation Council countries and those accompanying citizens of Gulf countries do not qualify. Special entry permits and 96-hour special mission entry visas are not included. Each extension will be for 30 days. The 30-day extension can be availed of only twice.